Today brings another room to be encountered on April's Quest. Pretty straightforward, I think. More rooms to come soon...! Print at 2.75x3.75" and trim along dotted lines. As you may be able to guess, this card is another nod to a fellow A-to-Zer...a little shout-out to Stacey, who keeps up a great horror blog (I guess that's the best way to categorize it...!) 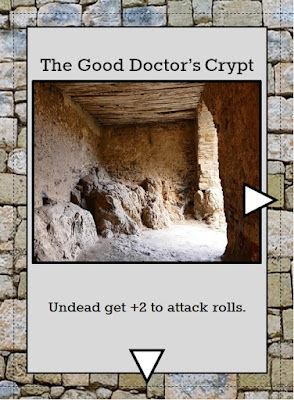 over at Dr. Theda's Crypt. His theme this month is the monsters of his childhood - you should check 'em out! Trying to figure out if that's a pun (no Pun intended). Thanks man!